Hollandia Amsterdam Review: An improved classic bike model. The Hollandia Amsterdam is a bike that comes from the country that absolutely loves cycling, and as such is made to perfection. With a gorgeous steel frame, alloy rims and plenty of other features along with a great outer appearance, this is a bike that is made to look and feel all kinds of wonderful. The Hollandia Amsterdam is a bike that is made for cruising. It makes use of a hi-Ten steel frame along with 28-inch alloy rims. We loved the metallic blue color scheme of the bike, along with the really decent weight of just 25lbs. Even better – the brakes are coasters which means that they don’t look or feel like they’re going to make you fall flat on your face! The bike was equipped with the Shimano Nexus 3 speed hub and includes a kickstand too. Assembly of the bike itself was a little confusing, because the owner’s manual only lists the assembly procedure for a mountain bike and a BMX bike. With a wrench and an hour to spare, though, you should have it assembled and ready pretty quickly. There were a lot of problems with this bike though, and we really didn’t appreciate the condition it came to us in. The chainguard kept hitting the chain itself, which was the cause of quite a bit of rattling until we took it off. The front rack wasn’t very secure, even when the bolts were tightened, and the packaging seemed to have been done so hastily that some of the smaller parts were missing. A bike that is made to be ridden with caution, if only because of the way it is delivered. The concept and the design are great, but the actual ride is lacking. 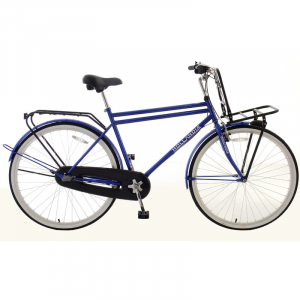 We found that the Hollandia Amsterdam was a great bike for the price you pay for it. However, it really didn’t shine, and was more often than not a hindrance to the cycling experience.